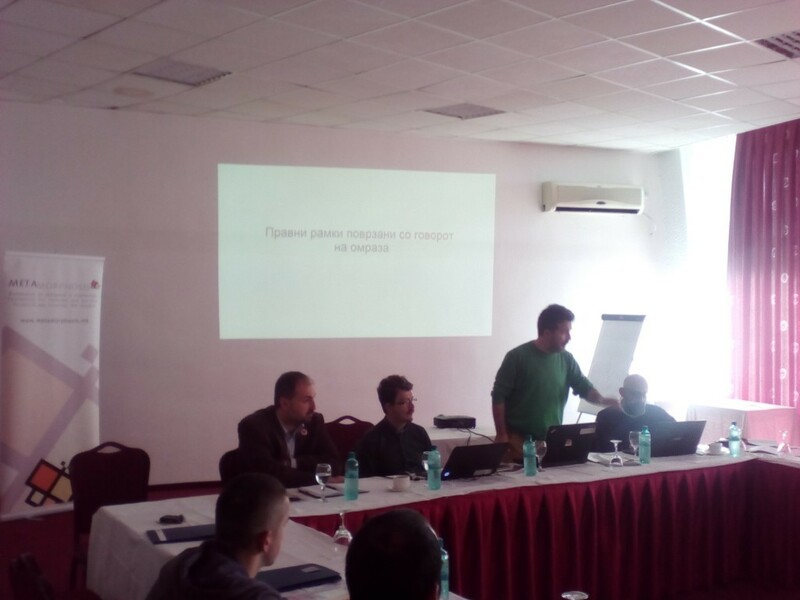 The second training of the series of trainings for tackling hate speech in the media took place on October 14, 2015 in Struga. 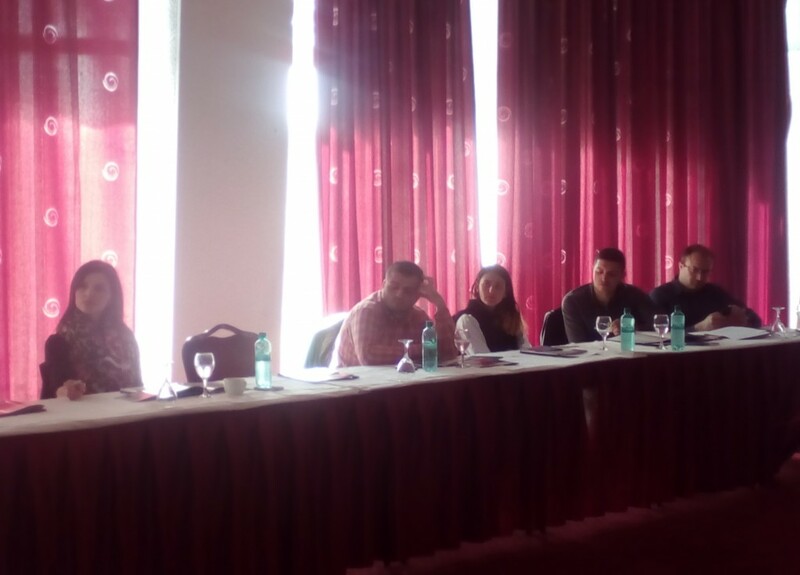 These trainings organized by the Metamorphosis Foundation and the OSCE Mission to Skopje are primarily intended for editors, journalists and news portals administrators. The one-day training was attended by 16 representatives of the media, including representatives of the local media that informed the public about this training. 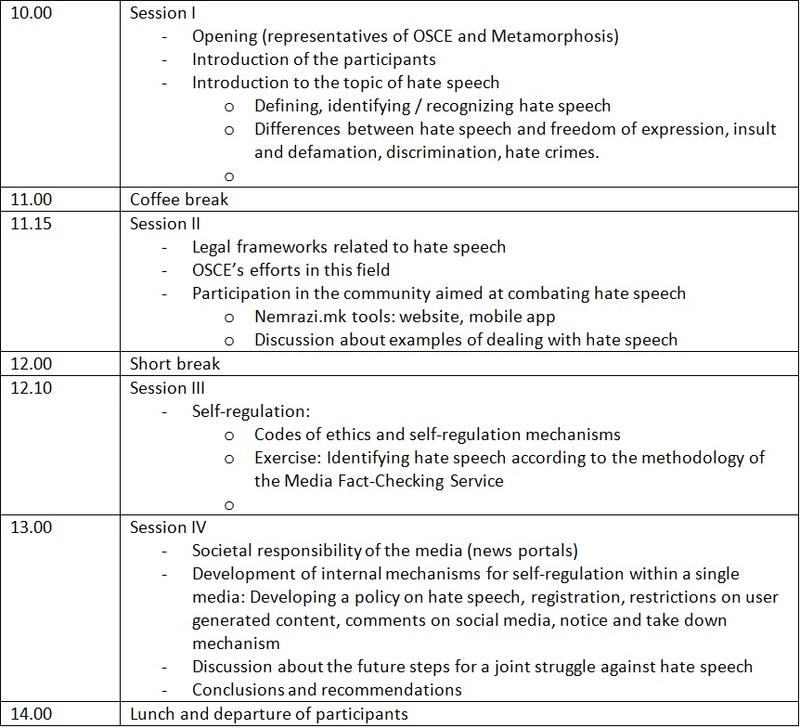 The trainings aim to strengthen the capacity of online media personnel in Macedonia to recognize and tackle hate speech and speech inciting violence and hate crimes, and to promote the professional journalistic standards in synergy with the Media Fact-Checking Service. In the session for discussions, the media representatives stated that these trainings help them in resolving some of the most pressing problems they are facing in their everyday work. The next training is to be held on October 20 (Tuesday) in Strumica, at the Sirius hotel. The expenses for the one-day training will be covered by the organizers. For participants coming from other places, travel expenses in the amount of a return bus ticket will also be covered. The number of participants is limited. The admission of candidates/representatives of news portals and other media to courses with capacity limits will be on a first-come, first-served basis. In cases when additional candidates apply for the selected training, they will be able to participate in the following trainings of the cycle, or will be invited to participate at the following events of similar type. All interested applicants are encouraged to complete and submit the online form no later than October 19, 12.00h. Applicants will then be contacted by the Metamorphosis team to confirm their participation. For further information, please contact the associate Adrijana Selmani via e-mail: adrijana@metamorphosis.org.mk or phone 02/3109 325. Purpose: Strengthen the capacities of editors and administrators of news portals and other media for identifying and tackling hate speech and speech inciting violence, through a series of three regional trainings intended for 20-25 representatives per region. Participants may bring a laptop and smartphone which would be helpful for their participation in the training.